La Vista is a spacious multi-leveled beach view villa with private pool and stunning sea views accommodating up to 16 guests. 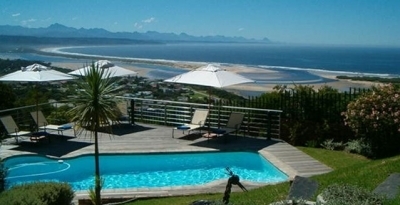 LA VISTA is your holiday home in Plettenberg Bay. Style and Luxury combined with 5 star mountain lagoon and beach views. Easy - living elegance. Overlooking the Tsitsikamma Mountains and Lagoon. Plettenberg Bay is characterized by unspoilt, long golden beaches, a dramatic rocky and sandy peninsula, intriguing lagoons and estuaries, towering indigenous forests and unpolluted rivers and the Indian ocean. With its exceptional climate, and beautiful view sites over the Indian Ocean, Plettenberg Bay is perfect for tourists interested in surfing, golfing, shopping, exploring or just lazing about. The house and its rooms are in excellent condition. Just ready for you! Enjoy the ocean view while you are swimming in the Pool.